Our laboratory's research interests span the disciplines of pharmacometabolomics and companion diagnostics, clinical lipidomics, nanotechnology, analytical chemistry and chemometrics. These interests are focused towards the understanding, early diagnosis and evidence-based treatment of critical illness and injury. In this regards, we place a special emphasis on wound healing as an easily accessible and yet highly relevant disease model. Recent analytical characterization undertaken by our group has identified key chemical entities in the form of lipid molecules that are important for healing of chronic wounds. This enabled us to obtain a pre-patent on these chemical species as therapeutic agents. Currently, we are in the process of incorporating these lipids into nanoliposomes as a means of efficiently delivering them into skin wounds in order to enhance healing. As analyzed by LCMS, these novel nanoliposomes demonstrate greatly enhanced delivery of the therapeutic agents to cells of interest. We are also in the process of investigating other functional modifications and chemical conjugations to the components of the nanoliposomal formulations to increase the half-life of these therapeutic agents in the harsh chemical environment of chronic wounds. Considering the uniqueness of the approach, we have applied for a pre-patent of this nanoliposomal delivery mechanism as well. Additional analytical characterization coupled with chemometric methods have also allowed our group to identify metabolites that are diagnostic of the healed state of wounds. This knowledge has provided us with a short list of molecules to be used as diagnostic markers of wound healing and led to the possibility of generating a small point of care devices for monitoring the progress of wound healing by measuring the concentrations of these diagnostic chemical entities. In this regards, we are actively investigating the use of nanotechnology-based fabrication methods for use in Surface and Tip Enhanced Raman Spectroscopy (SERS and TERS) based point of care devices. 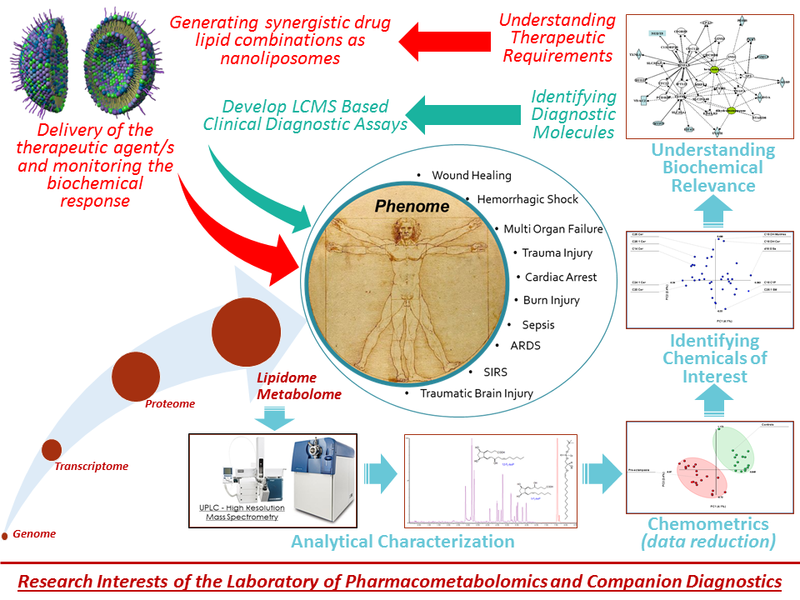 This combined approach of 1) extensive analytical characterization; 2) chemometrics-based data reduction; 3) nanotechnology-based point of care device fabrication and 4) nanoliposome-based drug delivery when coupled with pharmacometabolomics and companion diagnostics are the primary research foci of our group. This multidisciplinary approach is currently being utilized in the understanding, diagnosing and treating many additional human diseases related to critical illness and injury as outlined in Figure below.